In the closing months of 1918, the war is unexpectedly reinvigorated by a mad Russian general named Baron Nikolai Aleksandrovich Ugenberg, a figure loosely based on the history figure of White Russian General and Mongolian Khan Baron Fyodor Romanovich von Ungern-Sternberg. After crushing the Bolshevik Revolution, Ugenberg ushers in the formation of a Buddhist Russo-Mongolian Empire, whose first act is a war of conquest against Europe. By 1964, fifty years after the start of the war, both the Russo-Mongolians and the armies of the United States of Western Europe (USWE) are deadlocked in a vast trench network carved through the middle of Germany, with both sides quoting their armies and industries on the stock market to fund the war effort. The player is thrust into this maelstrom as Lieutenant James Anderson, a USWE veteran tasked with infiltrating the Russo-Mongolian lines and destroying a key weapons research center close to the frontlines. Overall, the gameplay is fairly standard for a shooter. The player is given the basic FPS arsenal to play with and most of the levels are rather linear. Still, the Western Front is no cakewalk. The trenches and towns of Germany are swarming with snipers and rocket launchers, so stealth and careful aiming are a must. Brainpower is also a necessity, for most levels have areas that can only be passed through careful exploration and clever use of the environment. Perhaps the most enthralling aspect of Iron Storm is the setting. Despite the dated graphics, the world of 1964 comes to life as a grim mélange of industrial warfare through the decades. From the First World War, the trench, the concrete bunker, the poison gas grenade and the cumbersome, infantry-slaughtering tank all make an appearance. In what must be a first for a video game, allusions are made to the Russian Civil War, particularly with the names and uniforms of the Russo-Mongolian army and the great armored trains of that conflict. World War II provides the styling for the machinery of the war, as well as such forgotten ideas as the bomb-armed “mine dog” unsuccessfully used by the Soviets against German tanks. The weapons are great, heavy engines of death that make loud, metallic thuds when fired. Along with the decaying world, the war between the two great empires has become a cynical, brutal thing. Neither side no longer has any qualms with using infantry-splattering rocket launchers in regular combat. Neither side has any issues with disposing of POWs with battlefield executions or mutilating torture. However, this violence is not of the typical gratuitous “blood and guts” video-game violence done solely for the purpose of voyeurism. Rather, by showing the viler aspects of war without resorting to dramatics or irony, it gives the player a sense of just how horrible the endless war actually is. 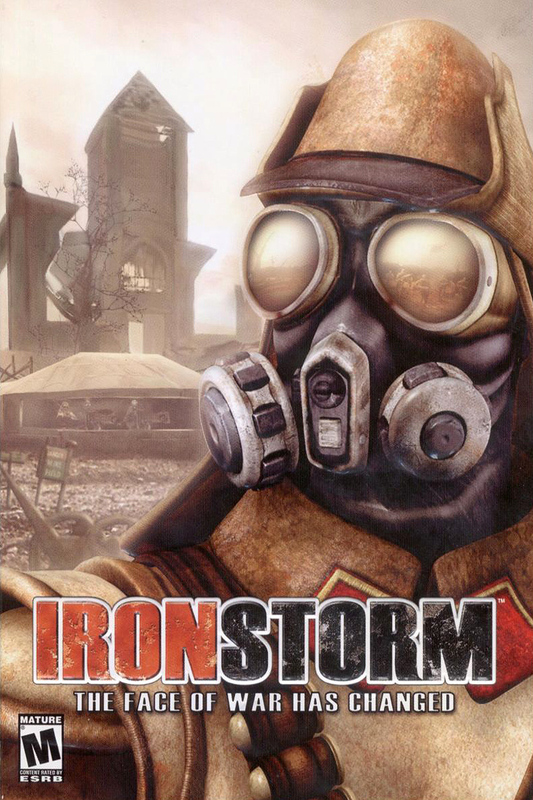 Of course, no game is without its flaws and Iron Storm is no exception. While the game runs solidly on current computers when properly patched, most of the graphics, particularly the character models, unfortunately show their age. Despite input from battlefield intelligence and your commanding officer, mission directives are often unclear, leaving the player to stumble around through trial and error. While the game has a stealth system, its effectiveness is often hit-or-miss, with enemies being either acutely sensitive to or blithely ignorant of your presence. Finally, the game has a rushed, vague resolution that does not really provide anything in the way of closure. Still, despite these flaws, Iron Storm is a game worth checking out, if only as a reminder that, while this is not the best of all possible worlds, it could have been much, much worse. This story first appeared in Gatehouse Gazette #5 (March 2009), p. 5-6, with the headline “Through Hell; Iron Storm”.